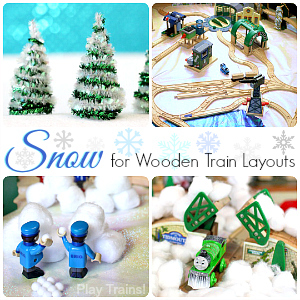 For our first post for the Winter Play Days series, we took our trains out to play in real snow. Today’s play idea is a way to echo that experience any time of the year with pretend snow for a fun sensory activity with a little science thrown in. 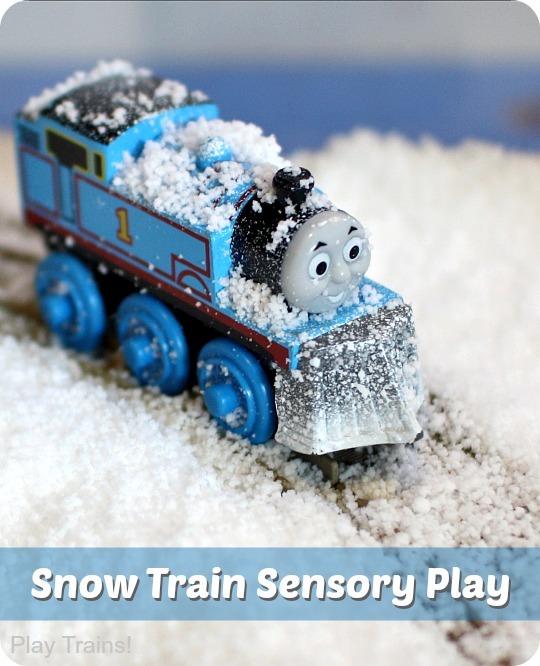 I’ll share a few tips for using pretend snow with toy trains in this snow train sensory bin, plus a list of books for extending the activity. At the end of my post, I have links to the Winter Play Days posts from my friends at Fun-a-Day!, Fantastic Fun and Learning, Nothing if Not Intentional, My Nearest and Dearest, and Buggy and Buddy, so don’t miss their creative ideas for winter play! 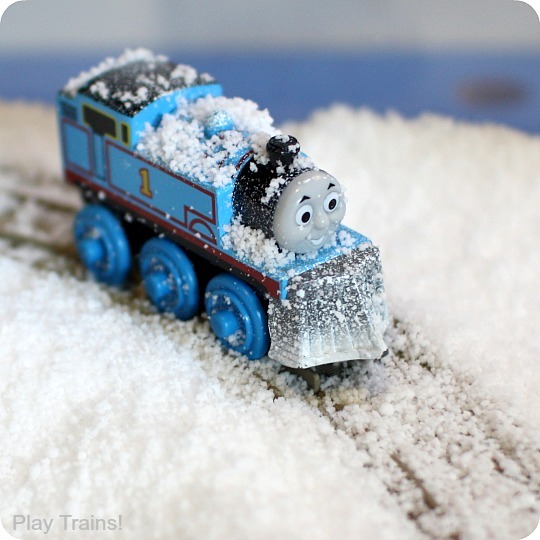 We’ve included our toy trains in pretend snow sensory play many times in the past. Our favorite kind of fake snow that mimics the real thing (more or less) is Insta-snow, a superabsorbent polymer powder similar to the stuff inside disposable diapers. It instantly absorbs water and fluffs up into a fairly snow-like substance. The effect is quiet dramatic! But if you get as much of the Insta-snow off after you’re done playing, the rest dries up back into that same, fine powder. Just brush it off the next day and your trains are back to normal. However, if you’re looking for something a little different in your Insta-snow, Blog Me Mom has a great list of Ten Ways to Make Pretend Snow. 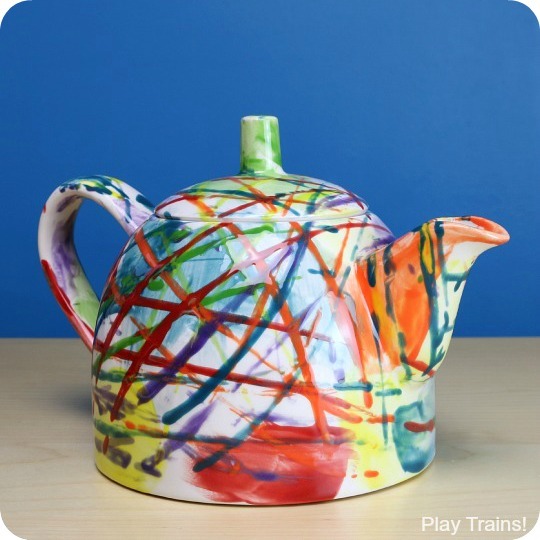 Anything dry should be safe for all kinds of trains; anything messy would be best with die-cast metal or plastic trains with no electronics, or wooden trains that you don’t especially worry about ruining. Make sure to rinse the trains off, dry them a bit with a towel, and set them to finish drying on something that will let the water drain off their axles. I learned that one the hard way, when some of our Take’n’Play engines rusted after we used them to paint with trains on canvas. 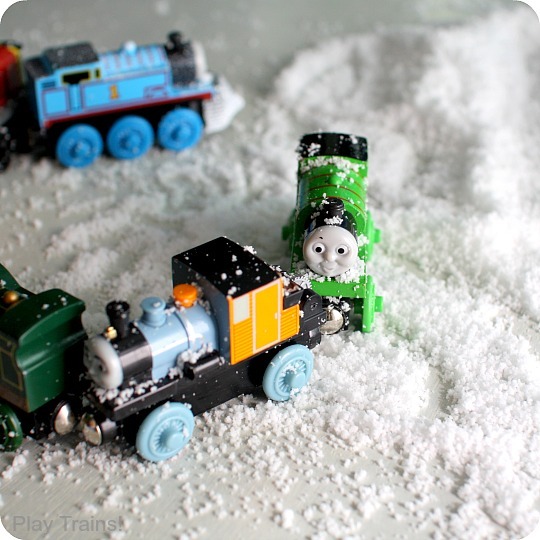 Whatever kind of pretend snow you use with your trains, be sure to take into account safety concerns, such as whether or not a child is likely to try to put the substance in his or her mouth, and always supervise young children during this kind of sensory play. When the Little Engineer became interested in “SCIENCE!! !” — as he says it — at the age of two-and-a-half, my husband started looking around at different fun science things to do with a little kid. By far, the most exciting thing he found was Insta-snow. The first time we played with it, we were all enthralled by the tiny bit of powder erupting into a hill of snow on the table. Both the Little Engineer and his dad had to press their palms deep into it, first thing, and then pick it up and squeeze it. There was a line up of wooden trains on a shelf nearby, including Winter Wonderland Thomas with his snowplow. The Little Engineer brought the engines over and started to connect them up in circles, sprinkling the fluffy snow on top, sometimes sending Snowplow Thomas off to plow through a hill. Note: Snowplow Thomas is available in the old Adventures of Thomas set with a smiling face or the new Adventures of Thomas set with a disgruntled expression. However, the snowplow is not necessary for the toy trains to functionally plow snow! 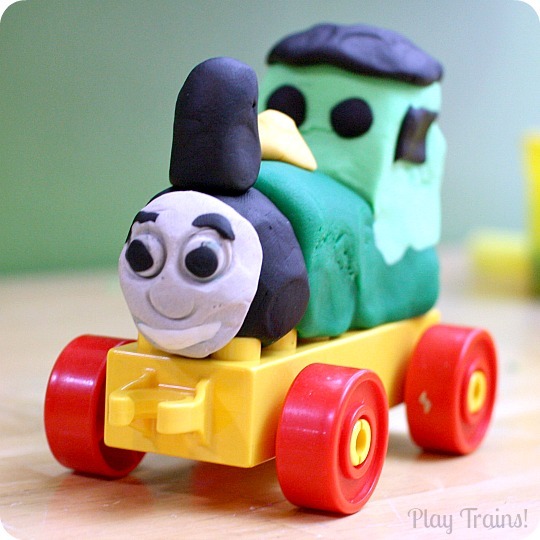 On the other hand, it might be a fun project to try to make your own snowplow to attach to a regular Thomas. (Might I suggest some residue-free duct tape to attach it?) Or, if you’re lucky enough to have access to a 3D printer, my husband designed a wooden train snowplow that fits over the engine’s front magnet that can be printed in plastic. It does not fit all of the Thomas & Friends engines due to their varying designs, but it generally works for Thomas himself. Now, if you want some deeper snowdrifts for your engines to plow or get stuck in, you’ll need more pretend snow and a bin to contain it in. We have a big, shallow plastic storage container from Ikea for sensory play, which allowed us enough room to add tracks to the activity. Because the tracks end up buried in the snow for much longer than the trains, I would avoid using wooden train track in this case, even if you’re using wooden engines. 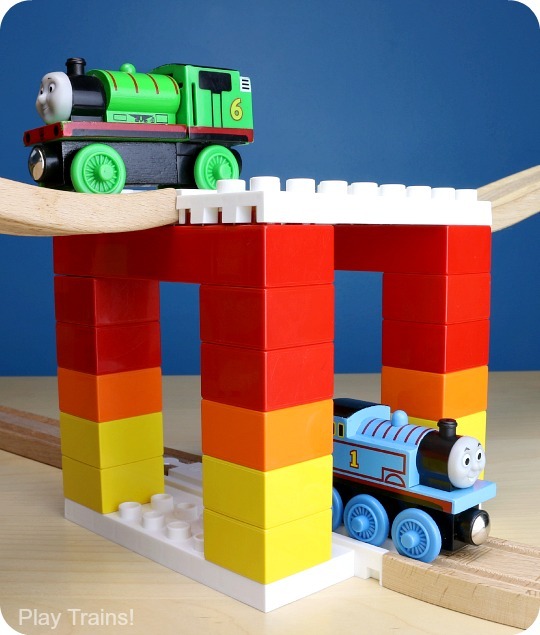 We used plastic Trackmaster track, which is the same gauge as a standard wooden train’s wheels. Wooden trains also fit on plastic Take’n’Play track. Here is “Poor Thomas,” similar to “Poor Toby” covered in cotton balls from our wooden train recreation of Thomas Gets a Snowplow. This is another fun way to act out that book. I just love the way the Insta-snow stays fluffy, no matter how long we’ve been playing with it! 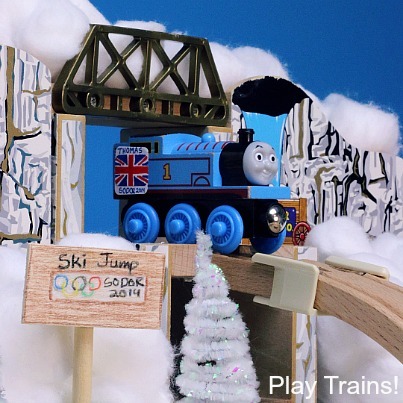 It looks so cool on the trains and the tracks, and we have fun pretending to be clouds snowing over Sodor. Ivor the Engine: Snowdrifts: A personal favorite! I love reading this one aloud. It’s based on an episode of the classic Ivor the Engine cartoon from the UK. You can watch the video on YouTube with (or without) your child, and I recommend doing so to get the flavor of the language in the book. While I can’t claim to get the Welsh accents exactly right, I think I have the rhythm down, and it’s more fun reading it that way. Thomas in Town: Valentine’s Day in Vicarstown: This is another book we’ve turned into a wooden train storytelling layout, as well as a counting activity that we’re still playing a year later. Thomas and the Christmas Tree sees Thomas covered in snow like he is above. If your child is a big fan of the classic, model train era of the television show, you might order a used copy of this book’s original version, Thomas and the Missing Christmas Tree. Many of the stories from the original Thomas the Tank Engine stories from the Railway Series include snow. I recommend picking up a copy of the out-of-print Thomas the Tank Engine: The Complete Collection over the newer — but abridged and more heavily Americanized — The Thomas the Tank Engine Story Collection if possible. Isao Sasaki’s Snow is a quiet and beautiful wordless picture book showing a day on the platform of a train station in winter. While we haven’t read the book version of Mickey Mouse Clubhouse Choo Choo Express, we’ve watched the Clubhouse Choo Choo gather magical, never-melt snow in the video many times. Don’t forget to visit my Winter Play Days friends to check out their awesome activities for today! 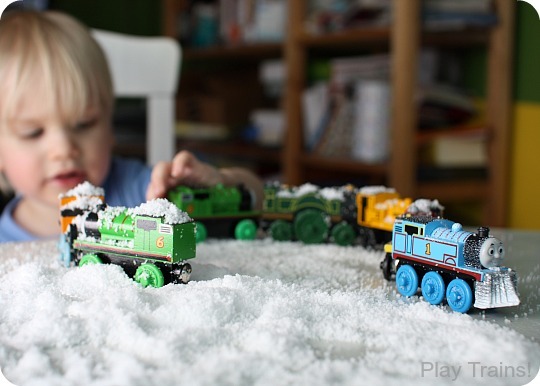 Some of the photos in this post were originally included in our list of ways to play with snow and trains in February 2013. Love this post, Jessica!!! We are all about the fake snow here~ no real snow to be found! And I love that you suggested some related books! ooo! Great idea to add a book list! I need to check some of those out!